Haven't had this much fun since the cayenne pepper hit the fan! Author Pat Kirkham discusses the opening titles for Advise & Consent, from her authoritative book Saul Bass: A Life in Film and Design. 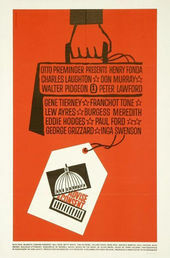 Thought by many to be the best film about American politics, Advise & Consent was based on a Pulitzer Prize-winning novel by Allen Drury. As with other projects, Saul generated many idea sketches. Among them, politicians appear as puppets on a string, or as mechanical toys to be wound up at will. The symbol that Saul and Preminger finally agreed upon, however, is a powerful visual pun about "taking the lid off" the Capitol itself — home of the U.S. Congress. Saul stated, "The basic idea of the book is the detailed study of the guts of our political system. The symbol says, in essence: inside Washington, what goes on underneath the surface? The 'top' is lifted off to reveal in letters the name of the picture." His image was so powerful that, shortly after the film was released, it found its way into political cartoons in Europe and the United States. The strong graphic symbol bookends the title sequence, and the theme of governmental politics is carried throughout the advertising campaign. The press book, for example, is designed in the shape of an official briefcase, complete with a label bearing the symbol of the film, while the main lobby card uses briefcases to carry credits.